I spend a fair share of time away from home at hotels or in Victoria. For anyone that travel frequently, you know how much hassle lugging chargers and cables can be. On top of your pluggables, you also have to worry about finding enough outlets at hotels. The first solution that I found is the Monster Outlet To Go 3 outlet surge protector. Lina and I travel with 2 or 3 cell phones, laptop, and a couple of iPods. Of course, we have one surge protector each. It’s the perfect travel companion as the short cable plug into itself, and is neat and tidy. Couple that with a USB-to-wall-charger and we can charge your USB device with ease. Recently however, I’ve discovered an even better device while browsing at Vancouver’s only Apple Store. 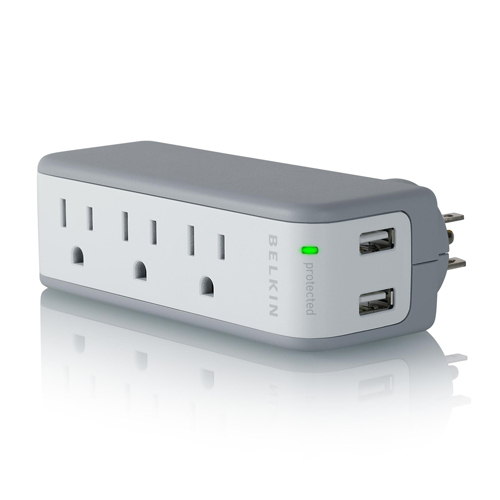 Belkin offers what they call a Mini Surge Protector with USB Charger: a surge protector with 3 household plugs and 2 USB outlets. How awesome is that. 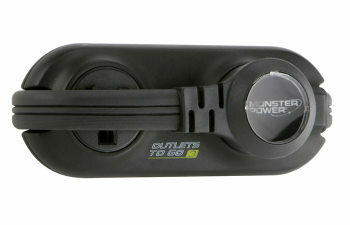 The main plug rotates 90 degrees to hang vertically or horizontally off the wall outlet. Now I don’t have to take my charger for my work Moto Razr and iPhone/iPod. And, that still leaves all three outlets for things like laptops and other battery chargers. All this for only $25 at the Apple Store. I’ve just finished packing my bags for my Vacation. It’s Fio and Phil’s wedding in San Jose this weekend–Congratulations! I am totally excited. Tomorrow after work, I’ll be picking up Lina and heading to the Seattle. Why am I flying out of SeaTac and not YVR? Because we can buy two roundtrip tickets through the US compared to Canada. Boo. Then Rendezvous with Gils and Sammy-poo for a 2 car convoy down I5. I’ve loaded my Ipod with as many Podcasts and Family Guy episodes that I can; packed my carry-on with some magazines and a novel; and have my cameras ready to roll. So many places to visit, so little time. I hope I get to bump into some internet superstars while I’m down there. *singing to myself* “…where little cable cars ~ climb half way to the staaars. Another museum morning. This time it’s a trip to the Field Museum. Again, the museum is huge. Also, once again, I was meeting Lina at the Navy Pier for 1pm, so I had to rush through some of the exhibits. The Field Museum has many many different areas and is the home of the most complete T-rex fossil, Sue. They also have a large collection of stuffed animals (not the kind you give to kids before going to bed), but the kind that was once alive. They even have some real mummies. Cool and creepy. After rushing through some exhibits, I made my way over to the Navy Pier and had a Chicago Style hotdog. It comes with mustard, hot peppers, relish, celery salt, tomato, and a pickle. Mmm. The Pier was a neat place to take pics, but not that exciting as most of the stores were closed. It’s more of a summer attraction. After that we did little shopping around downtown, checked out the Bean (actually called Cloud Gate) at Millennium Park, and finally went over to Hancock tower for a 360 degree view of the city at night. Get ready for Home time. We pack up our stuff and leave it with guest services. Our plan for Day 5 is to head back to Millennium park and take more pictures of the buildings and art pieces before we head back to the hotel. After our park venture, we had lunch at Giordano’s for it’s famous Chicago style stuffed pizza. We shared a medium and didn’t have to eat for the rest of the day. Did a bit more shopping and headed to the airport. The trip was a lot of fun. If you are going to Chicago for a visit, I would recommend that you get a CTA pass for 7 days ($20) for unlimited use of their transit system as well as the Chicago City Pass for the attractions I’ve visited. Since, I was running around quite a bit I wasn’t able to find many of their free WiFi spots around, but there are plenty of them. Keep and eye open for Caribou Coffee (they have great Chai Lattes with soy milk) and Panera Bread if you are looking for free WiFi access. I sure wish I had an iPod touch while I was there. Check out my pictures on Flickr. We started off the day at 3am to wake up and confirm our cab reservation. We take a shower and off we go to the Victoria International Airport (YYJ) for 4am. Crazy time to be there. Not even Tim Hortons is open at this time and wasn’t going to be open for another hour. Getting to Chicago via Seattle was no problem. Security and Customs weren’t as bad as some people say it is. Things went very smoothly except for our delay arrival. Once in Chicago, we went over to the Magnificent Mile for some looking around. This morning I headed out to the Museum of Science and Industry. I added the option of the U-505 sub tour and took in the Sea Monster Omnimax movie. The ground floor exhibits were very cool. I was finally able to make it to the 2nd floor, which is the “Main floor.” These exhibits weren’t bad, but I found out half way through that the Museum was closing in the next 45 minutes. Needless to say, at that point I rushed through the sections to get as much as I can. I didn’t make it to the 3rd floor. I had arranged to meet Lina at Watertower Place at 7pm, and since the Museum closed at 4pm, I took my time. I walked along the Michigan and Wabash. Found the Lego store and an Apple Store. Sweet. To cap of the evening we ate at the Cheesecake Factory. Yes, you read correctly Gils: I ate at the Cheesecake Factory. So far, as of 5:30pm Chicago time, I visited 2 attractions: Adler Planetarium and Shedd Aquarium. Both were very nice and the size of these places puts our exhibits and museums in Vancouver to shame. If the rain stops soon, I’m going to head over to the fountain that you see in the opening sequence for Married with Children. I was having a hard time finding a Wifi location and I don’t, and don’t think I’ll have enough time to upload all the pics. I think that’ll have to wait until I get back.